O God, our shelter from the stormy blast, and our eternal home: even as our prayers rise with each morning’s sun for those left battered and bruised, we bow our heads in humble thanksgiving for the generous partnership of Disciples everywhere. Fount of every blessing, pour out your streams of mercy on every heartfelt gift and every inundated home, that all might know you as our help in ages past and our hope for years to come. In Jesus’ name, Amen. This past week our hearts and minds have been filled with images of our siblings on the Texas Gulf Coast who have been affected by Hurricane Harvey. Our prayers went out for these communities as we watched homes submerged underwater: elders stranded in waterlogged buildings; churches, usually places of refuge and worship, rapidly flooded. We saw rescue workers, neighbors, and strangers risk their own lives to save the lives of others. Some of us have feelings of dismay, overwhelm, despair, or anger; we cannot comprehend how so many are hurting. Yet, we are also coming together, in prayer and generosity. That is where hope lies. God is in our coming together, as Church, to respond when our family is in need. Three churches have sustained severe damage, and roughly 12 more have had moderate flooding, water intrusion, and roof damage. More than 100 families connected to our congregations have had flooding or other damage to their homes. As we have been reminded by many emergency responders, now is not the time to come to Texas. Affected communities are busy enough without having to coordinate logistics for outside volunteers. Housing is also at a premium for evacuees and emergency personnel. The commitment and compassion of outside volunteers will be critical in the coming months and years, mostly long after the headlines have moved on, as we clean up and begin repairs. In the meantime, we – Week of Compassion staff, Vy Nguyen, Caroline Hamilton-Arnold, as well as Interim National Hispanic Ministries Pastor, Lori Tapia, and I, your general minister and president – have been reaching out to pastors and congregations to help assess need, pray and encourage these shepherds in the midst of this storm. Week of Compassion staff have received phone calls and e-mails from so many of you asking what you can do to help as the disaster has unfolded, and we thank you! Disciples from across the U.S. and Canada have offered to come down and provide relief, because sitting still is difficult for us. It is in our DNA to help. 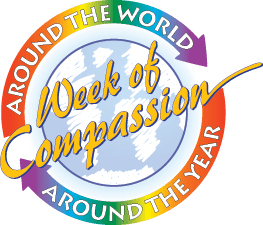 Please know that through your prayers and gifts to Week of Compassion, you are already present in Texas, where we are supporting the relief efforts led by our congregations. Responses include providing shelter, distributing food and cleaning materials, offering emotional and spiritual care, and helping those who have been able to return to their homes begin the process of mucking them out. The whole Church is committed to the long-term recovery. In the parable of the Good Samaritan, Jesus tells us that the Samaritan not only rescued the man on the Jericho road he suffered attack, but he provided funds to ensure the man was supported in his on-going recovery. (John 10:33-35) In the next few weeks, Week of Compassion will work closely with local churches, area ministries, regional staff, Disciples Volunteering, and Voluntary Organizations Active in Disaster (VOAD), as well as Disciples Church Extension Fund, National Benevolent Association and Pension Fund, to rebuild these communities in the years to come. It is who we are and how we have done it, together, as a church family, after other disasters — Hurricanes Katrina and Rita, the Joplin tornado, smaller flooding events, and now Hurricane Harvey. Please continue to keep the people affected by the storms in your prayers. And please continue to donate to Week of Compassion as 100% of your gifts will be used in the weeks and months to rebuild. Whenever we serve sisters and brothers in need, we are the presence of Christ. Together, we are there in Christ’s name.